ProfessorDr DavidNginsianpau shared a link on 4th December, 2012 Tuesday. Re: [WorldCitizen] Re: To Unite 50 States of America, Sign the Petition. The " why" has been already posted in We the People page, i.e. all the 50 States including Washington DC have filed petitions of secession. I am a World Citizen and a Christian at the same time so, I mentioned World Government and a Christian Ministry that I have been leading it outside the USA, in the hope that expressing exactly who I am maybe a great help to get an employment and to understand or legalize my status by the USA without having a nationality. I worked with English teachers from native English speaking countries in China until 2009, the time Obama became the President. After Obama became the President, no more employment or teaching English job opportunities for me not only in China but also in the whole Asian countries until today. To me, I know that my problem lies with Obama. Therefore, the petition is worth filing in We the People page of the White House. I support Mitt Romney, in fact. Subject: [WorldCitizen] Re: To Unite 50 States of America, Sign the Petition. The author of the petition did not mention why President Obama should resign. How Obama resignation will help the formation of World Government World Government of world citizens organization is not initiating steps for the Formation of formation of World Government. But taking up unnecessary discussions in the group. So please think of organizing for the formation of World Government by popularizing the concept of world Govrnment among the people of the world in every country by starting the chapters of the organization in every country and initiating the people. please think in those lines . To solve the problem of petitions of secession sent from the 50 States of America to the White House, I've sent a petition to the White House a day ago. If you support this petition for the building up of a peaceful and prosperous USA with American Dreams and American Value, add your signature. Create your own account, register it, open your email and activate your account, and then click the button and sign. It's easy and nothing to lose. We need 25,000 signatures by December 16, 2012. See the petition in this link : http://wh.gov/X9UJ . It is going to be twelve months since I came for resettlement interview on 6th December, 2011. I am still waiting for the next process that I will be able to resettle in a third country in the future. It's been four years since I first came to the UNHCR in Kuala Lumpur for Refugee Status Determination interview. Would you mind giving me the result of resettlement interview? Shall I come for OPE interview without an appointment? I have no other way of getting even a legal national identity or a legal national passport and no way of escaping from unemployment and serious discrimination problems that will eventually and definitely result in persecution and imprisonment in Malaysia and in Myanmar except resettlement program of UNHCR. Your kind help in processing resettlement soon in a third country is the essential part of safety living as long as my refugee status remains the same. I am looking forward to hearing from you soon. Please see attachment for PDF file of this letter. Thank you for your reply. My brothers sometimes don't have enough money to operate their telephone so kindly contact me in case you can't contact them. I will bring both Mr.Thang Khan Khai and Mr.Vung Khan Tuang to the UNHCR office on the date of appointment that you will make. My number is 0189898412. Thank you once again for your kindness that brings hope to our family. Thank you for your email. Please be informed that your request for registration on family unity grounds has been received. We are keeping it in our record and your family would be contacted to schedule them for a family unity interview appointment. Subject: Kindly register Thang Khan Khai and Vung Khan Tuang, who have been waiting for two years. This is to inform you that two of my younger brothers, Mr.Thang Khan Khai and Mr.Vung Khan Tuang have been waiting for their name to be registered under UNHCR Representation in Malaysia for two and a half years. Since there was no registration at the time they came here, they went to the office of a refugee agency called Alliance of Chin Refugees (ACR) and got registered under Tedim section. The purpose of coming here is to approach the UNHCR and to flee from persecution and unfair practices of the Burmese government by means of not giving even a single job to our family members, collecting money for different purposes every now and then and forcing us to do manual work without getting paid which lead us to live with hunger many a times since our childhood. The same persecution never end just like that until now for our family. We are eleven in our family including my mother but three of us including me could run away from the country so far. Thus, kindly get these brothers of mine registered as soon as you are able, and help us to get the UNHCR card at the same time for which we will be grateful. My father, Nang Khan Do passed away in March 2007 so I am the head of my family as the eldest. I hope you won't mind in helping us by getting Thang Khan Khai and Vung Khan Tuang registered at the UNHCR office as soon as possible so that they can stay in Malaysia safe, freeing from fear of arrest and MI, military intelligent' further persecution. I am looking forward to hearing from you in a jiffy. Your precious help in this regard shall be very much appreciated indeed. Subject: Remove my name from tutor number-1040 from teacher list of Educare! This is to inform you that I have liquidated the agreement made between Educare- Rashid and myself. Moreover, I request you to remove my Tutor ID from Educare registration for English Tutor. I can't work with Educare any more since Hazel has no understanding at all in my situation. This is the type of treatment I don't like to face as a teacher. Kindly remove my name from both Educare center and from RM30 registration I made last time. I can't come to the center any more from now on. As I have to get another teaching English job, make sure there is no connection between Educare and me any more. I hope you understand what I mean. It's a rare opportunity to work with you for three months. Subject: Kindly remove me from schoology notification! Would you please remove my email address from schoology notification as I have no connection with Cempaka School any more. I have been receiving Schoology notification via no-reply@schoology.com since Ausgust, 2011. For your information, the contract I signed with Cempaka School has been completed, and I have no connection with the school since then. Thus, kindly remove my email address i.e. david@ciuac.org from schoology notification. Thank you in advance for your help in this regard. Subject: Thank you very much for interviewing me! I want to thank you very much for interviewing me on last Thursday for the English Language Teacher position. I enjoyed meeting all of you in Inai Room and learning more about the English courses you offer. The interview strengthened my enthusiasm for the position and interest in working for University of Malaysia. I believe my education and cooperative education experiences fit nicely with the job requirements, and I am certain I could make a significant contribution to the Faculty of Languages and Linguistics over time. Thank you for submitting your CV on IATEFL.org. I'm afraid we cannot accept CVs as formal applications for any of our positions. To apply, please visit our website ( http://www.britishcouncil.org/learning-teachingjobs.htm ), complete the professional profile and send it to the email address listed in the job(s) you wish to apply for. Are you on LinkedIn? If you are and are interested in working for the British Council as a teacher of English, why not join our group? open days and events across the UK and overseas. be it salary scales in Sudan to "How much is a pint of milk in Mexico?" I send you herewith a letter of job application confirmation submission from Harvard University, USA which I received on 31st January. In addition, I have also applied for English Lecturer or Assistant Professor of English position at two other universities online - University of Nebraska at Kearney and The City University of New York in the USA. Please see the forwarded messages below from the three universities I mentioned above. If I got the job offer at one of the universities I applied for English Lecturer or Assistant Professor, would you be able to help to process my application that I could go there to resettle and teach? Will this meet the so called durable solution to my case? I am sure they will review my application in two or three months as they told me so. I hope you will be able to do the needful to process my RST as and when it's necessary. I need your kind reply in response to this email at your earliest possible convenience. For job application I use david@ciuac.org besides cdimdirector@gmail.com . In general, no Tamilian job interviewers or recruiters in Kuala Lumpur so far gives me even a single job offer though there are many educated recruiters among them. I can say that Tamilian recruiters are discriminators to me in my job seeking which I think will not help me even in resettlement country, USA. This message comes with evidence in my job interviews for two years in Malaysia. Whether educated Tamilians like it or not, I send you this message because it's true even to my personal experience in Malaysia. interest in this position at the University of Nebraska at Kearney. sender-time:Sent at 2:26 PM (GMT-05:00). Current time there: 7:24 PM. ? employer and is committed to building a diverse workforce and strongly encourages applications from minority and women candidates. We will contact you as the review process proceeds to inform you of your status. To review your information, click the following link. I am forwarding the reply letter from Kuala Lumpur US Consulate in response to my inquiry about a refugee visa to go to the United States for resettlement. Please read the email below. Regarding resettlement in the USA for me as a UNHCR card holder, waiting for the UNHCR's process until I have the chance to go there is the alternative possible option. Hence I need your appointment for OPE and DHS as soon as you are able. You may refer the documents which I submitted through OPI section recently for further elucidation of the urgency. and was given a third country to go to i.e. the United States of America. The interview was made by a UNHCR resettlement officer in Kuala Lumpur last month. Am I eligible to obtain a refugee visa to go to the United States now? I have been waiting for the opportunity more than two years, since December, 2009. Could you do me a favour in this regard? I am an individual applicant who doesn't like to be controlled by the Burmese, its government and investigators though my country of origin is Myanmar. I'm just living individually. I await your kind reply in a jiffy. Please contact them for information. Sent at 5:54 PM (GMT+08:00). Current time there: 10:09 PM. ? My name is Mr.David Ngin Sian Pau from Cheras near Leisure Mall, Kuala Lumpur. I personally would like to know if you had the type of visa called Refugee Visa to go to the USA individually as a refugee for resettlement with the permission of the UNHCR Representation in Malaysia. If you had a refugee visa would it be applicable to me? My status i.e. UN Refugee makes me to send you this email as an inquiry. Enclosed attachment is a copy of my UNHCR identification card. To get to know more about my educational background and experiences in the past please visit http://www.ciuac.org/res.html or visit my website here, http://www.ciuac.org/f.php . I am looking forward to receiving a reply email from you in a jiffy. Sender-time: Sent at 7:09 AM (GMT+12:00). Current time there: 1:47 AM. ? subjectRE: Inquiry about Refugee Travel Document for New Zealand. I have been asked to respond to your enquiry regarding Refugee Travel Documents. As you have been informed, New Zealand does not issue Refugee Travel Documents for people who wish to apply for temporary visas to New Zealand. A Refugee Travel Document may be issued by the New Zealand Government�s passport office to a person who is not a New Zealand citizen and who has been granted permanent residence by Immigration New Zealand (INZ) based on their refugee status in New Zealand. INZ may issue a Certificate of Identity (COI) to facilitate travel of refugees who have been granted permanent resident visas after selection for resettlement under the New Zealand Government�s Refugee Quota Programme. Other than declared spouses and dependent children of refugees resident in New Zealand, all refugees included in Refugee Quota Programme must be presented to Immigration New Zealand (INZ) by the Office of the United Nations High Commissioner for Refugees (UNHCR). As resettlement places are extremely scarce globally, UNHCR will normally only refer those cases they consider meet the UNHCR criteria for resettlement and with protection needs which cannot be provided in the country of asylum. Furthermore, please note that INZ does not directly request UNHCR to refer individual refugees to New Zealand for resettlement under the Refugee Quota Programme. The final decision with regard to referral for resettlement to New Zealand lies with the UNHCR office in the refugee's country of asylum, regardless of whether they have a sponsor in New Zealand or not. Sent: Tuesday, 5 July 2011 5:59 p.m.
Subject: Re: Inquiry about Refugee Travel Document for New Zealand. I don't mean that is for a temporary stay but I am looking forward to settlement permanently or temporarily because my friend in New Zealand and the UNHCR Representation in Malaysia recommended and supported me to apply for the visa. The term is applicable to me both because if it's going to be a temporary basis, it is going to be for permanent as it is the next step to temporary. Why I talked about temporary settlement is that I told the UNHCR in Kuala Lumpur that I wanted to go to the USA for resettlement first. But there is no possibilities to go to USA now. Moreover, there is no one in America who supports me in this process even when I am in this kind of very difficult situation. But I have one whose name is Michael in Wellington and he is the one who is willing to sign for me as a witness. Michael also told me that I would need to go for training for sometimes in New Zealand and then get a job over there as a refugee. The only thing I need now is the entry visa and refugee travel document as it is not something that the UNHCR in Kuala Lumpur does. I can't get a passport from Myanmar embassy because I am a genuine refugee in Malaysia. Because of the situation I am in right now, I have to go away from Malaysia as soon as it is possible. I am looking for a way out as it's not possible to live in Malaysia without the local government support. Here in this online link: http://www.passports.govt.nz/vwluResources/COI-RTD-form.pdf/$file/COI-RTD-form.pdf which Michael gave me just now, I can read the procedure of how to apply for a travel document. If there is any possibility, please let me know. And I want to know where the application should be submitted. Is it enough to understand what I mean? If you have any other question, please let me know. And I hope you will make it possible for me to be able to get a refugee travel document for New Zealand and a visa. Please let me know all documents which I need to submit along with my application and fees in your next email. for a temporary stay, however I may have misunderstood. Sent: Tuesday, 5 July 2011 4:16 p.m.
Subject: Inquiry about Refugee Travel Document for New Zealand. kind of Certificate of Identity, with the help of my friend, Scott Michael Inglis in Wellington? 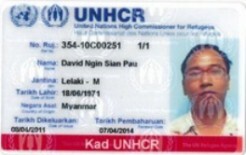 no travel document except the UN identification card issued by the UNHCR Representation in Malaysia. It has been a long time since we last corresponded. I see that you have gotten world citizen status and it appears that you are still in KL able to make a living. I wish you the best and pray blessings on you and your family. I am writing to let you know that I will no longer be able to continue as President of CIU. I do not wish to have my name on the website or be associated with CIU in any way. I chatted with you about this perhaps half a year ago but apparently I didn't make my point clear enough. For this, I blame myself. I also wish that my wife not be on the website either; there is false information about her degree and such. I don't mean to hurt you in any way, but I can not be associated with CIU any longer for personal reasons. I am sorry that this is the way it must be and I wish you all the best. Please accept my resignation and my humble apologies. People, who do not look into how these three groups of different religions live together in a country, may say that they coexist relatively in peace. But in reality, they don't. Especially, Muslims hate the coexistence of Christians and Muslims together though Christians don't. Christians are more peaceful than Muslims so you know who is to blame when problems occur between the two. Therefore, Muslim community lives in a particular area where there is no Christians, even though they live together in a country. I don't know much about Jewish. Based on my knowledge, the world will be better and peaceful if Christians, Muslims and Jewish don't live together in a country but live differently in separated countries. According to different international news for the past 20 years, Muslims started all the problems occurred among Jewish, Christians and Muslims most of the times. No tolerant to other religions is the key to success in Muslim communities around the world. Even in Malaysia, the ruling party or the majority is Muslims that has made me jobless for 3 consecutive years even now because of not belonging to a Muslim community. This is the reason why I have been asking the UNHCR to resettle me in a third country in USA, Japan, Canada, New Zealand, Australia or one of the European countries, where I can get a permanent teaching job with my qualifications. I can say Muslim is not a religion any more nowadays but a government system that doesn't have any concern for other religions or individuality. There are some local Christians but most of them live exactly like the local Muslims, using the same hatred to foreigners and international job seekers as the local Muslims do, using the same techniques as the Muslims do to discriminate individual refugee even in the church and torturing the most vulnerable people in the country as the Muslims also do the same because they know they are gonna win. So I call Christians in Malaysia "Islamic Christians". What a pity! Because living a Christian life in Malaysia is not fully based on the Bible any more but more on how to get favor from the local Muslim government. I am sure these facts are also applicable to Christians, Jewish and Muslims in Palestine and the State of Israel. I am not an expert and not sure about Sharia law, but the Prophet Mohammed wrote in the Qur'an that Christians and Jews should be respected as "people of the book" There are Islamic countries where Christians, Jews and Muslims have coesisted relatively in peace. A one state solution would not be viable only if they all convert to christianity and leave Islamic law (which does not even accept the idea of non-muslims having the same rights in islamic countries). one-state-solution? Is there an even better alternative? Subject: Complaining unfair treatment between myself and Tamil society. In connection with my personal experience between Tamil society and myself for the past 20 years, I would like to confirm that Tamils are nice to talk to. I don�t hate them in person since they are human beings like me. But when it comes to job giving and job seeking, as an individual, I have never been given a professional teaching job by Tamil job owners though I applied for the job at Tamil firms, companies and private language schools in Madras, South India and in Malaysia as well. Moreover, when a job was offered to me, most of Tamil job seekers seemed trying to replace or violate my job status and stability in my previous work places. When I lose a job, no other job has never been sanctioned to me especially in Tamil society in Madras and in Malaysia as if I were the person who could live without food. No concern or no job sanction has been given to me by Tamil society so far that makes me feel bad, oppressed, dictated and monopolized like the circumstances of living under communism. They violate human rights and the rights that I have in seeking job, the right of choosing the type of job I can do best, salary requirement that I have to claim and the right of changing job option. Therefore, I request and let the UNHCR office know that no Tamil should be my job owner, supervisor, co-worker or leader in the society of my resettlement country in the future, otherwise I will never have any better life than before. If possible, I want to go to a society where there is no Tamil at all, exactly like I mentioned earlier that I wouldn�t want to stay with Matu people. This is my problem in Malaysia for the past four years so I don�t want to face the same problem in resettlement country any more. I hope you understand and let me know the possibility.